Liverpool absolutely thrashed Bournemouth 4-0 at the Vitality Stadium on Saturday afternoon, a result that took them to the top of the Premier League. A hat-trick from Mohamed Salah and an own goal from Steve Cook ended up being the difference between the two sides, as Liverpool continued their unbeaten start to the Premier League season. 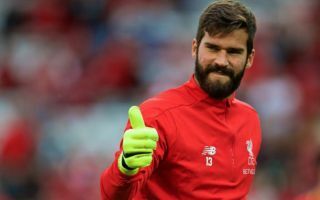 However, that wasn’t the only thing that was impressive from the Reds’ performance, as by not losing the match, it meant that goalkeeper Alisson broke the record for the most games without losing at the start of a player’s Reds career. The record was previously held by Javier Mascherano, who went his first 15 games without losing when he joined the Merseyside club from West Ham back in 2006. But, following their win earlier, Alisson broke the Argentine’s record, as he’s now gone 16 games in a row without defeat at the start of his stint with Liverpool. Alisson can take major credit for this feat as well, seeing as the Brazilian has been a key player for Jurgen Klopp’s side so far this season. The former Roma shot-stopper has kept 10 clean sheets in his first 16 Premier League games for Liverpool, as he looks to claim the Premier League Golden Glove award in his first season in England.